Widget to listen and record Internet radio. Is there a better alternative to Radiotastic? Is Radiotastic really the best app in Audio category? Will Radiotastic work good on macOS 10.13.4? Radiotastic... Listen to your favorite radio stations from the Dashboard by using the free Radiotastic widget. It's easy to add Internet radio streams, so your favourite music, news and sports shows are at your finger-tips. 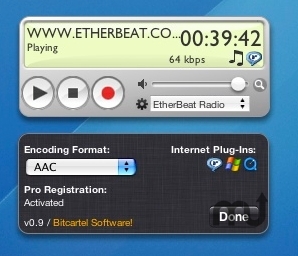 Listen to almost any audio stream broadcasting in popular formats such as RealAudio, WindowsMedia, QuickTime, and mp3. Making use of Internet plug-ins ensures Radiotastic stays at the cutting edge of net audio. Version 0.9.3: Fixed an issue where recent Apple updates caused loading of streams to fail. Radiotastic needs a rating. Be the first to rate this app and get the discussion started! Ever listened to the radio and wanted to quickly record a song or interview? With Radiotastic, don't miss a beat! Recordings are iPod friendly (AIFF, AAC and Apple Lossless formats supported). The free edition of Radiotastic records for only 15 minutes, upgrade to the Pro version and record as long as you want.